This summer, our favorite creative duo (Sky and Devin from Pura Soul Photography) took Mala and Mantra along on all their international adventures. From Italy to Jordan, see what they did, wore, ate + experienced while exploring the world. "That scarf is a traditional Jordanian pattern, and we were in a place called Rumi Cafe, which is known as a gathering place for creatives and artists in the city. Their tea selection is incredible and brought an entire scope of options that we aren't used to seeing, like teas from Yemen and Iran. 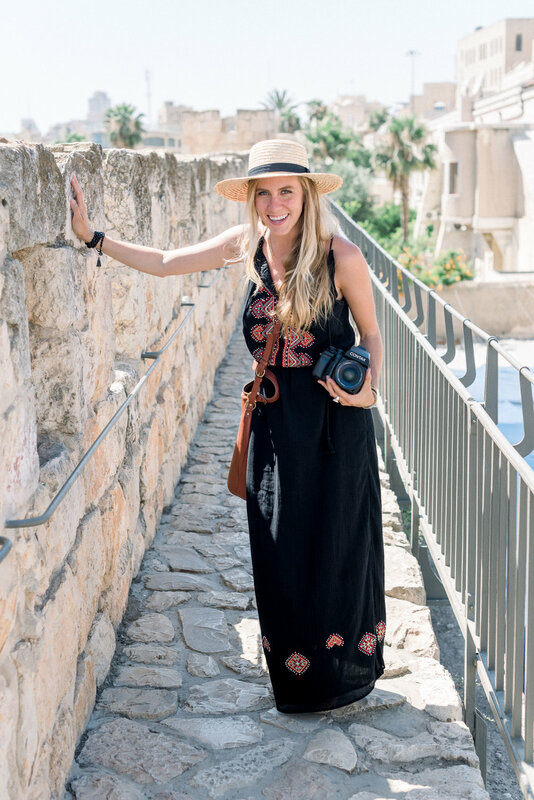 It was up a steep hill from our hotel in downtown Amman and worth every step." "It was so incredible to see this place in person." "It's an incredibly beautiful desert inhabited by Bedouins and camels. The stars at night are perfection." "Tel Aviv is a beautiful and delicious city right on the beach." "We learned so much about how both Muslims and Christians have cherished the city for centuries and that for much of that time, they have existed peacefully together. In one particular meeting, two high-ranking religious leaders were finalizing the details of a deal for peace and prosperity for both sides of the city. When they finished, the call to prayer sounded and the Christian leader told the Muslim leader that he could pray in his church. The Muslim leader told him that he was very kind and that while he did believe his prayers would be welcomed by God from the Christian church, he feared that his followers would build a mosque inside the church just to document the historic moment. So as to kindly stop the church from having to figure out how to deal with having a mosque inside, he went outside and prayed next to a tree. There is now a mosque there. The mosque and church have been side by side ever since." Follow @purasoulphoto on Instagram for more travel + adventure photos, and learn more about Sky + Devin at https://www.purasoul.com/.